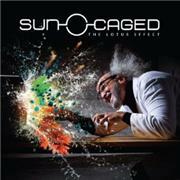 Dutch progressive shooting stars SUN CAGED release their awaited third album. The info sheet says that it´s their most diverse effort yet. Formed by ex LEMUR VOICE guitar player Marc Coenen and drummer Dennis Leeflang in 1999 the band seems to be moving places. They debuted in 2003 with their self titled album, and followed it up in 2007 with “Artemisia”. Coming from highly experimental sounds, they are now an up and coming progressive band with influences from DREAM THEATER to IRON MAIDEN. The album delves in stories and circumstances that can be extracted and into universal and relatable feelings and ideas, and with some eastern philosophy thrown in for good measures. Is this going to be yet another fine progressive album filled with intricate music for driven musicians? Some basics first; This is a band filled with accomplished musicians, capable of writing intricate arrangements and playing around with themes and pace changes. The opener “Seamripper (& the Blanket Statement)” takes off with some wake up sounds from a radio, a touch of PINK FLOYD perhaps? It is way heavier (at least for 1.40) than I expected. There are elements of fusion and some fine musicianship. But it has to stand back for the sheer excellence of “Tip-Toe the Fault-Line”. I don´t mean to split hairs since the “worst tracks” are of a fine standard. But the easily listened, in spite of the vocal experiment, RUSH evoking and pretty heavy story that is told is simply outstanding. The same goes for the voicecorder plagued yet highly enjoyable DREAM THEATER reminiscent “Shades of Hades”, with its atmospheric piano parts, and “Lotus”. The latter being a song of many dimensions and angels, and a lot of atmosphere. There are touches of RAINBOW with TONY CAREY, YNGWIE J MALMSTEEN and artistic freedom with the concatenation of tracks ten to 14. There are also touches of playing music for other progressively inclined musicians, as well as guitar patterns and keyboard work that would work in many more circumstances. The short “Full Circles” gets on my nerves for some reason, perhaps due to its filler character. But as a whole this is highly enjoyable prog with one foot in the common camp, and one foot in the company of geniuses connecting with other equilibrists.